Feeling proximity to a work of art is seductive. For example, I’ve convinced myself that the paintings of Marc Chagall and the novels of Per Peterson are tailored-made just for me—an audience of one. Whatever words best describe this very particular, very greedy, sense of possession must be the definition for great art. I feel a similar possessive closeness to Robert Hunter Jones’s new book of poetry, Winter Garden. There is no sound of water. you can’t stop living it. and you slide down in. it becomes someone else’s silence. you feel on your tongue. Try again and it’s closer. inside your own, roll over and listen. The fleeting and apparitional is everywhere and in every form. In many ways, the presence of absence is one of the golden threads twisting through these pages. This leitmotif flares up in the form of memory-as-ghost (“Exact Directions of Light”) and father-as-negative-space (“My Father Drinking Water”), whereas on other occasions it’s the glimpsed separation from one’s native geography (“Listening Through Smoke”) that gives this book a visceral sense of haunted longing. 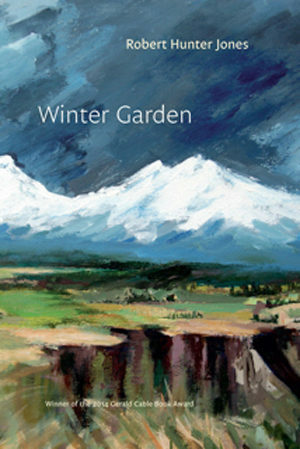 On the whole, Winter Garden is an earnest investigation of liminal spaces, that poetic dreamscape where “Sometimes words falter / at the edges of moments like these, just beyond reach / in shadows that’ll turn any face we dare to recall” (“Thumbnail Sketch”). Jones never shows us the same hand twice, shifting from poems fueled by narrative tension and sense of place to lyric meditations that drift as obliquely as they please. Likewise, Jones’s lexical pendulum swings from the direct and knowable to the dense and philosophical without ever leaving us scrambling for footing. From poem to poem (and within individual poems), Jones moves with a sense of surprise and invention that defies expectations and keeps the reader traveling forward with full-titled engagement. The book snakes between the past and present, landscapes foreign and domestic, the empirical and the decidedly intellectual, and each time you try to slap a tidy label on these poems, the next page reveals a counterpath, a counterargument, a disparate mode of artmaking, a varied pitch, or a new register. In this way, the architecture of the overall book is as poignant as its individual poems. What’s difficult to ignore is the unabashed display of Jones’s engagement with the intellectual. In a season of empty political rhetoric and spineless punditry, bearing witness to a mind at work is a welcome shot of adrenaline, and it’s also a reminder of one of the genre’s essential powers—to show us the inherent meaning (and joy) in the art of thinking. Frankly, there are so many moments of genuine profundity that one loses count. It’s unfair to rip lines from their contexts, but lines like “Memory is night / redacted by the gravity of time” (“Exact Directions of Light”) and “Casual is the root word / of casualty. The unmeant act / that opens a random path leading / to the rest of our lives” (“The Bullfrog”) are nothing less than astonishing. In the hands of a lesser poet, such moments might reek of pseudo-intellectualism and would certainly crumble under the slightest breeze. As much as I steer clear of the philosophically explicit in poetry, and as much as I prefer my ideas couched in so-called Deep Images, I just can’t resist Jones’s world of big ideas. Robert Hunter Jones is easily one of the finest poets writing in the Pacific Northwest. The best of the poems in Winter Garden rank among those in William Stafford’s Traveling Through the Dark and Richard Hugo’s 31 Letters and 13 Dreams. If such assessments sound bold, it’s because they are meant to, for this is a bold collection written by a poet whose artistic gifts are numinous. I see a special kinship between Jones and Hugo, each of whom finds a depth and meaning to becoming permeable. Both poets cross thresholds of dreams and hinterlands of memory in an effort to carve out a personal, meditative terrain where lyric invention and mysterious inwardness come together in language that is both carefully crafted and artistically ineffable. Michael McGriff is the author of several books, most recently the story collection Our Secret Life in the Movies (co-authored with J. M. Tyree), which was named one of NPR’s Best Books of 2014. He is an assistant professor of poetry at the University of Idaho.